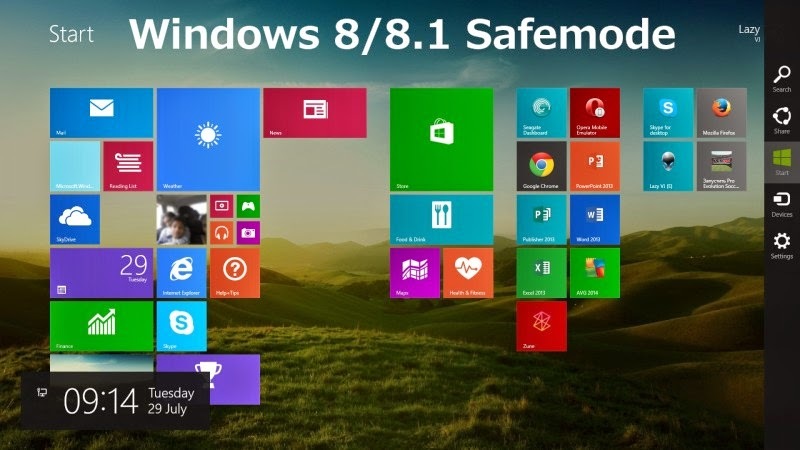 Many of the users think that there is no Safemode in Windows 8 & 8.1. But there is Safe Mode in Windows 8 & 8.1. Safe mode is a diagnostic mode of a computer operating system (OS). It can also refer to a mode of operation by application software. Safe mode is intended to fix most, if not all problems within an operating system. It is also widely used for removing rogue security software. An operating system in safe mode will have reduced functionality, but the task of isolating problems is easier because many non-core components are disabled. An installation that will only boot into its safe mode typically has a major problem, such as disk corruption or the installation of poorly configured software that prevents the operating system from successfully booting into its normal operating mode. Though, it varies by operating system, typically safe mode loads as few executable modules as possible and usually disable devices, except for the minimum necessary to display information and accept input. Safe mode can also take the form of a parallel "miniature" operating system that has no configuration information shared with the normal operating system. For example, on Microsoft Windows, the user can also choose to boot to the Recovery Console, a small text-based troubleshooting mode kept separate from the main operating system (and can also be accessed by booting the install CD), or to various "safe mode" options that run the dysfunctional OS, but with features such as video drivers, audio and networking disabled. Safe mode typically provides access to utility and diagnostic programs so a user can troubleshoot what is preventing the operating system from working normally. Safe mode is intended for maintenance, not functionality, and provides minimal access to features. Microsoft Windows' safe mode (for 7/Vista/XP/2000/ME/98/95) is accessed by pressing the F8 key as the operating system boots. Also, in a multi-boot environment with multiple versions of Windows installed side by side, the F8 key can be pressed at the OS selector prompt to get to safe mode. Step 1: Start RUN by pressing Windows Key + R and type MSConfig.exe and press Enter. 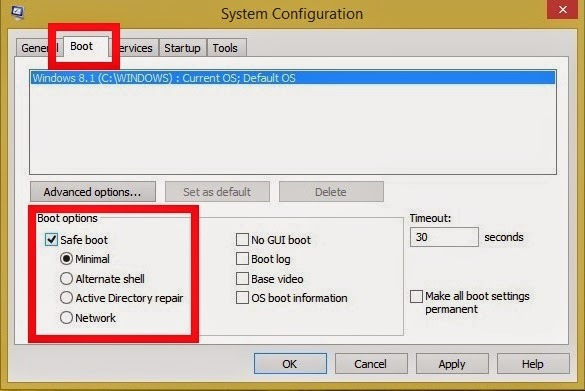 Step 2: Go to the Boot tab and enable the Safe Boot under Boot options. Step 3: Click OK button. Next time you start your Windows PC it will show Safe Mode or the Diagnostic mode.